If contrasting media reports are to be believed, the 21-year Test career of an enduring and complex character, West Indian senior batsman Shivnarine Chanderpaul has come to a dismal end following his exclusion in the 12-member training squad announced in Barbados for the upcoming two-test series against Australia in the Caribbean. "This was a tough decision for the selection panel to make," Lloyd said. "We recognise the significant contribution Chanderpaul has made to the West Indies teams over the last two decades, but we want to take this opportunity to introduce a number of young, promising players into the squad. 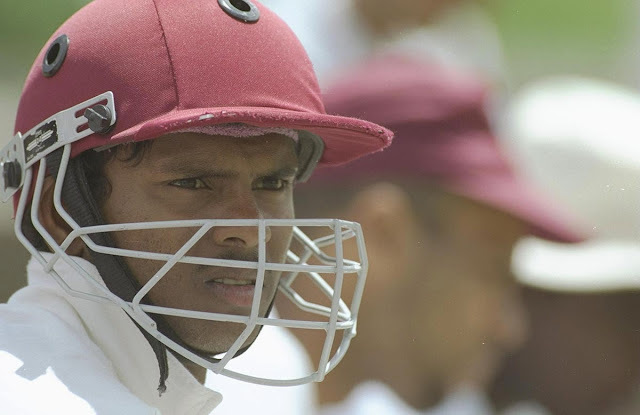 "Chanderpaul, who has played 164 Tests and is 86 short of equalling Brian Lara's record of highest West Indies run-scorer in Tests, was officially notified. Lloyd said that while Chanderpaul had been an outstanding servant of West Indies cricket for many years, his recent form was a concern. "Over a period of time we've noticed a decline in his form," Lloyd said. "For the last 11 innings he's averaging 16. We thought that the time has come to look towards the younger players. That's why he was omitted." "I don't think it's just the last couple of games. It's going way back, I watched the games against India, South Africa, and he hasn't really done as well as we had expected." "We just thought that here it is, we must now make a decision. We've made a decision. We are looking towards the younger people that we have. We have a lot of good young cricketers and we think it's time we now inject the youth into our cricket." Here’s a tribute to the great. 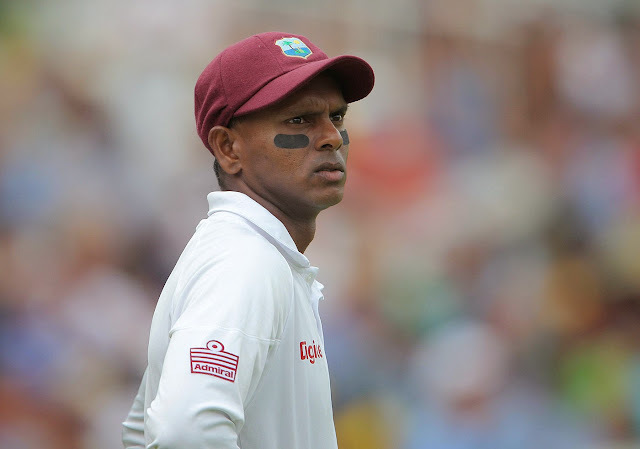 Born back in the fishing village of the Caribbean known as Unity situated near the mouth of the Mahaica River, Chanderpaul was the last remaining player from the mid 1990s, when the Indies were unstoppable. He is the only Indo-Caribbean to play 100 tests. As he was born in a fisherman’s family, he would have continued the family tradition and go on to become a fisherman, but this lad had other intentions. He left school at a tender age of 13 to pursue the sport of Cricket with his eyes fixed on following other Guyanese batting heroes Lloyd, Rohan Kanhai, Roy Fredericks and Alvin Kalicharan. He owes a lot of his success to his father Khemraj Chanderpaul who played an integral role in developing his cricketing skills at a very small age. He built a rudimentary kit for Shiv consisting of bamboo pads, a bat with a bamboo handle, protective clothes etc. Want to know the secret to the development to his rock solid defense? It all started when his father used to pitch hard concrete balls at the young Chanderpaul, on a shiny concrete pitch by the shore. This daily practice made him a strong player that we see today! He made his first-class cricket debut for Guyana at the age of 17, facing Leeward Islands in the 1991–92 Red Stripe Cup. He was run out for a duck in his first innings, but scored 90 runs in the second. His List A debut followed a few days later, against Barbados, in which Chanderpaul did not get a chance to bat in a match with no result. He achieved his maiden first-class century in April 1993, playing for the West Indies Board President's XI against the touring Pakistanis. After taking four wickets in the Pakistanis' innings, Chanderpaul was one of three West Indians to score a century, scoring 140 runs, and remaining not out. Cricket will never witness a calm figure like this again! Chanderpaul was one of those players who let his bat do the talking! He was never seen arguing or sledging somebody, he simply did not believe in it! In my opinion only Rahul Dravid and Shivnarine Chanderpaul were the only ones who managed to do that. Coming to hi style, while some may describe his batting technique as ‘unorthodox’, it still fetched him a truck load of runs, in fact 20,000 international runs and many a tons to his name! After 21 years in international cricket, today people recognize him primarily due to his unique batting style. While he faces forward, his bat is angled towards square-leg, prompting Scyld Berry to describe his stance as "perfectly orthodox... provided the bowler delivers from next to the umpire at square-leg, not the one at the bowler’s end. We all know what impact he made out there at the 22 yards. His unique technique made it more difficult for the bowlers to get him out. Years went by and he mastered the skill thoroughly, garnering 11,867 Test runs at a stunning average of 51.37 in 164 tests. He has scored 30 test centuries till date. Not only that, but he also scored 8778 runs with the help of 11 tons in the 268 one dayers that he played for his country. Shivnarine Chanderpaul may not be the most attacking batsmen but the West Indian is one of the few cricketers who have hit a last ball six to seal off a win! 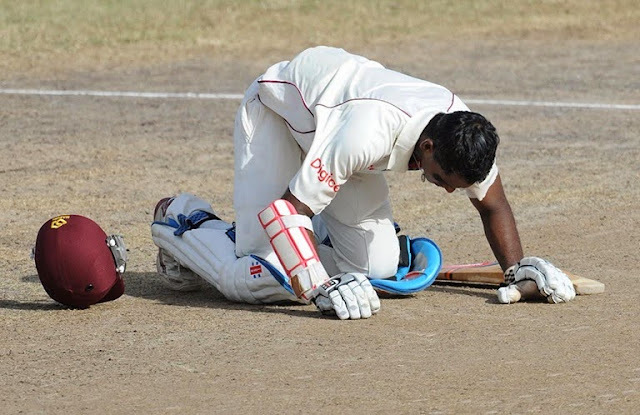 This happened in the 1st ODI played between West Indies and Sri Lanka at Trinidad in the year 2008. With his team requiring 10 off 2 balls and Chaminda Vaas, the great Sri Lankan fast bowler bowling, Chanderpaul hit a four and a six to take the match away from Sri Lanka. There are many such tales of this “Tiger” as they call him, winning matches for his country and rightly bringing up his name in the greats of the game. Today Cricket bids farewell to one of its unsung heroes! A beautiful era has finally come to an end! Thank You for all the memories that you gave us, we will always remember you.